Transition from pre-school to school is a very important stage in your child’s life. Beststart Baverstock opened beside Baverstock Oaks School in 2013. This was an exciting and necessary addition to the community. The numbers attending this new pre-school increased rapidly and it is now full. Baverstock Oaks has established close links with the pre-school. Children who are enrolled in Baverstock Oaks School and are currently attending the pre-school now get numerous opportunities to visit Baverstock Oaks School. A term prior to the children starting school they visit the reception classroom they will be in. This happens each week. They are accompanied by a Baverstock Big Buddy (Year 4 or 5 student), Beststart teacher and one of the Baverstock Oaks Associate Principals. 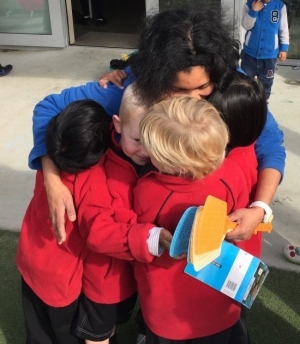 This is a wonderful opportunity for them to get to know their new teacher, become familiar with the school environment, make new friends with children already at school and build up great relationships with some of the older students at school. As well as this opportunity one of our two reception teachers visit Beststart each week to read to the pre-school students. The Beststart students look forward to their visits and become familiar with the teachers they will have when they first start school. 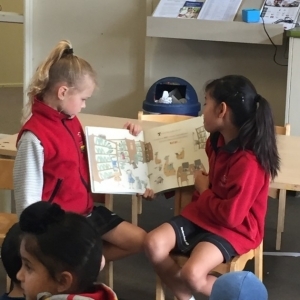 Each week another group of Baverstock Big Buddies also visit Beststart during mat time and read stories to the children. Once again this is a wonderful way to form relationships with the students as well as providing exciting leadership opportunities for our older students. Once a fortnight Beststart children who are close to starting school will also attend our Friday Full School assembly. They are accompanied by their Big Buddies and get to experience this school wide celebration time. Alternative Fridays they get to visit our library and have stories read to them. This is a very successful initiative and our reception teachers are noticing the first day of school for these students is an exciting and stress free time for them.